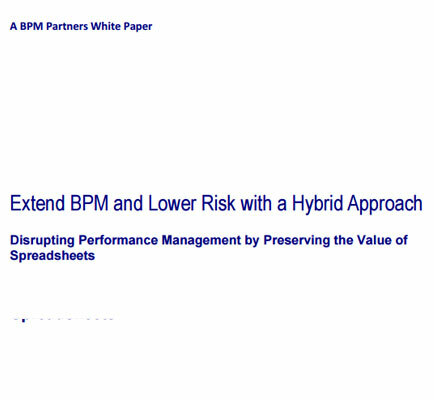 "Hybrid Approach for Extending BPM with lower risk"
How does a hybrid approach to performance management disrupt conventional solutions while preserving the value of spreadsheets? The hybrid approach to performance management is basically a design approach that combines a centralized database, workflow, and protective governance of spreadsheets for both input and output vehicles. This whitepaper examines the tradeoffs of the relatively new hybrid approach, and how it wraps data governance around the spreadsheet as an input vehicle.